Orihuela is a historical inland city, which is located at a distance of 50 km southwest of Alicante. 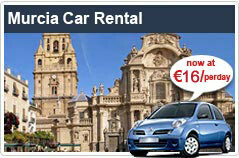 By using Orihuela car rental service you get to explore various destinations in and around the city. We provide you with the advance booking facility which will be solving your last minute doubts or any confusion. For the top-notch car rental Orihuela deals, you can also book a car using our online booking management system. Our rental inclusions include roadside or breakdown assistance, 3rd party insurance, collision damage and theft waiver, and airport fee. We also provide you with around the clock customer support if you have any queries related to Orihuela car rental. The city of Orihuela covers a total land area of 367.20 sq km2 and it has a totalpopulation of 77,960 inhabitants. The Romans were responsible for the settlement of the city and the name of the city is also provided by them. The city enjoys a rich cultural heritage in the region and it was also home to the well-known poet of Spain, Miguel Hernandez. The city is blessed with various tourist attractions and beautiful landscapes. Enjoy your commuting from one place to another stress-free with car hire Orihuela. Enjoy a relaxing time at some of the gorgeous beaches of the city. The city is having 16 km of beautiful beach and some of the beaches are - Playa Flamenca, Zenia, Mil Palmeras, Campoamor, Cabo Roig, and Punta Prima. The city is having two important monuments – Palace of Rubalcalva and The Cathedral. The Cathedral was constructed on the land which used to have a mosque in XII century. Palace of Rubalcalva became the part of the city in year 1976. The Palace is having marble staircase which takes you to the main salons. Church of Santiago was built in 15th century and inside the church you will really like the sculptures of Francisco Salzillo’s family. Choose to rent a car in Orihuela and leave all your worries behind.